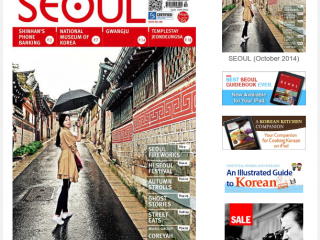 FYI: The digital version of the October Issue of SEOUL is now available at Apple’s Newsstand. The Android version is on its way. 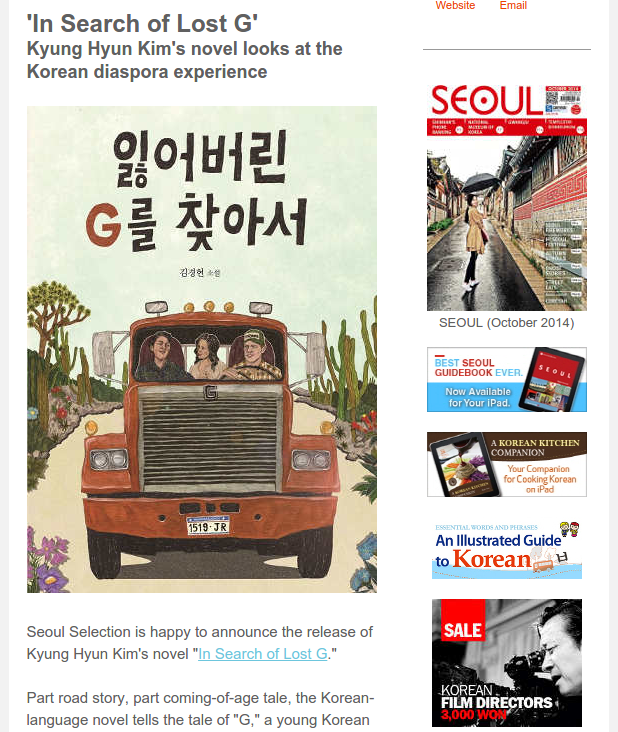 Part road story, part coming-of-age tale, the Korean-language novel tells the tale of “G,” a young Korean man from an upper-class family in Seoul struggling at a prestigious private high school in New England. When he disappears with his girlfriend Paige. G’s mother flies in from Korea to join his cousin in the States and Paige’s grandfather to track him down. They’re not alone in trying to track down G, though. The novel examines a number of facets of the Korean diaspora, including the phenomenons of “studying abroad early” and US dormitory life. 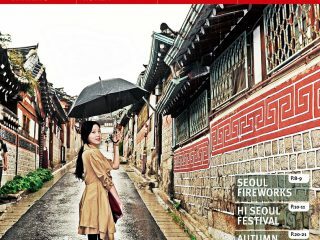 ATTENTION GYOPOS: SEOUL is looking for people to participate in Novemberâs panel discussion on being a Gyopo in Korea and how people treat you, as well as how you perceive yourself. The theme would be something like âNative or Foreign?â If youâre ethnically Korean but were raised abroad, or if youâre a native Korean whoâs received a good chunk of your education abroad, this discussion is for you! Korean adoptees are also welcome! Those who are interested should send an email to English@seoulselection.com with your name, age, phone number, occupation and length of stay in Seoul. Why are millions of Americans binge-watching Korean dramas? The boys of “Non-Summit” discuss learning Korean. Is Songdo Korea’s city of the future? OK, this music video is a bit odd. Despite tensions, Korean, Chinese and Japanese film crews are working together. Beautiful morning a Seooreung, a Joseon Dynasty royal tomb. The romantic Gwanghallu at night. Another week goes by at Robert Koehler’s photoblog. Although the Busan International Film Festival started as a small event in the port area of Nampo-dong, it is now the largest film festival in Asia. In 2011, the festival’s popularity allowed it to relocate to a new, luxurious home in the Busan Cinema Center, Centum City, in the fashionable Haeundae area. Costs to erect the building peaked around USD 150 million, and the space was designed in a sleek, avant-garde fashion by Austria-based architecture collective Coop Himmelblau. Last year, the festival showed 301 films from 70 countries; this year’s roster is set to include 313 films from 79 countries, with 132 world and international premiers. Although major stars and directors are always present, the focus of the festival always has been new films and emerging directors. The festival also offers a variety of special events and outdoor performances. Tickets for opening and closing films are only available online, while 20 percent of seats for regular films (both indoor and outdoor) will go on sale at on-site ticket booths. Set on a normally peaceful Jarasum Island (“terrapin island” in Korean) in Gyeonggi-do, the Jarasum International Jazz Festival has been hosting some of the world’s most prominent jazz musicians for the past 10 years. The event attracts over 200,000 visitors ever year, the majority of which actually end up being repeat attendees. The festival was selected by the Ministry of Culture, Sports and Tourism this year as Korea’s best festival. A couple of major acts this year are U.S.-based jazz fusion quarter Yellowjackets and Cuban trumpeter and pianist Arturo Sandoval. The popularity of the festival has made competition to perform very stiff, with only 20 acts being selected for the final cut among the 500 who applied. As every year highlights a particularly country’s jazz tradition, this year’s spotlighted country is Norway. The Korean-German Chamber of Commerce and Industy Seminar, in cooperation with the MindsGroup, will be hosting an intercultural seminar to help foreign residents of Korea gain a comprehensive understanding of intereactions with Koreans. The seminar consists of two, half-day sessions with presentation slides, workbooks & participantsâ real-life cases. If you’d like to participate, RSVP by Oct. 24, 2014 by submitting the registration form you can download here. The Renaissance Seoul Hotel’s Club Horizon is hosting its ‘Unlimited Pleasure’ promotion where you can enjoy unlimited wine or beer with eight different kinds of snacks, icnluding grilled sausage, tortilla chips with tomato salsa, cheese quesadilla with sour cream, smoked salmon canapÃ©, garlic shrimp, assorted cheese plate, fried chicken wings and seasonal fresh fruits. PRICE: KRW 35,000 for unlimited beer and a snack and KRW 48,500 for unlimited wine and a snack. The opportunity to see two of Koreaâs best pianists perform on one stage is attractive on its own. What’s even better, however, is that they’re brothers. Lim Dong-min and Lim Dong-hyek will join forces for their first shared recital in nine years. The playlist is slated to include the two complete Chopin concertos, with Lim Dong-min, the elder of the two, playing the first while Lim Dong-hyek takes on the second. Joining them will be the Gyeonggi Philharmonic Orchestra and conductor Sung Shi-yeon. The two brothers shared third prize at the 15th International Frederick Chopin Competition in 2005, becoming the first Korean pianists in the concert’s history to make it into the top five. Unlike other famous pianists, Lim Dong-min started late, at age 9, while his younger brother started playing at age 7. Chopin wrote and premiered both concertos in 1830, and the adagio movement of the first is supposedly dedicated to the woman he loved at the time. In actuality, the famous composer wrote Piano Concerto No. 2 first, but published it after number one. He was only 20 years old when they both premiered. In spite of its name, Scala and Kolacny Brothers is a Belgian women’s choir that is conducted by Stijn Kolacny with arrangements and accompaniments by Steven Kolacny on the piano. They were formed in 1996, and won Belgium’s Choir of the Year contest in 2000. Although most of their tunes are rearrangements of well-known songs from major musicians such as Oasis, Bjork, Radiohead, U2, Nirvana, Depeche Mode and others, they’ve also produced a great deal of original material. Those who are familiar with the film “The Social Network” may remember the rendition of Radiohead’s “Creep” featured in the preview—one of the many works of Scala and Kolacny making a splash in pop culture. Greek tragic dramatist Euripides is generally considered one of the three great tragedians of classical Athens, the other two being Aeschylus and Sophocles. Although he is said to have written around 92 plays, only around 18 have survived more or less complete. Distinguished for exploring the dark side of the human psyche, his masterpiece “Medea” takes audiences down the eerie path of a woman who takes revenge on her unfaithful husband by slaying not only his lover but also their children. This dark piece has been reborn as a work of changgeuk, or traditional opera. The hatred and anger of the original Greek tragedy is accompanied by the sorrow inherent in Korean music. The Global Gathering is an annual dance music festival organized by Angel Music Group, which serves a pivotal role in the international festival market. Since being founded in 2001, the festival has become one of the U.K.’s most popular electronic music fests. The festival offers a wide range of genres such as house, trance and dubstep, and is held across the globe, stopping in places such as Ukraine, Poland, Turkey, Russia, Belarus, Australia and the U.K. Global Gathering Korea was first held in 2009, with every event held since then surpassing the last. This style of music event is part of a larger trend of taking electronic music out of clubs and into outdoor venues, and the results so far have been epic. This year’s lineup includes Dada Life, Idiotape, Bassjackers, Krewella and more. Todayâs visit is intended to give participants a chance to admire the work of Master Oegil, Kim Kyeong-Ho, a calligrapher of outstanding skills. For many years now he has been studying the ancient practice of Sutra copying, using powdered gold or silver, in an attempt to revive a tradition that flourished in Korea some 1,700 years ago. Having spent many years in an attempt to recover the lost techniques required to prepare and color the paper, and to acquire sufficient calligraphic skill for the task of copying the sutras, he established the Korean Transcribed Sutra Research Association in order to communicate these skills to as many others as possible. In particular, the skill he displays in the paintings and ornaments, with lines a fraction of a millimeter in breadth, is breathtaking. Kim Kyeong-Ho has held 15 exhibitions of his work, in Seoul, Los Angeles and New York. COST: Free for members, KRW 10,000 for non-members. Fields of flame grass as Haneul Park. Photographed by Robert Koehler.